2 of our favorite things! This recipe requires very little hands-on time. It's nourishing and simply delicious. Pizza and sourdough... 2 of our favorite things! This sourdough pizza requires very little hands-on time -- and is nourishing and delicious to boot. Adapted from a recipe from this website. Pour starter, oil, and salt into a medium-sized mixing bowl. Then add 1 cup of flour to the mixture. Next, sprinkle your counter with flour. Place dough mixture on top and begin kneading. Then knead dough until all ingredients are happily combined. Remember, you are looking for a dough that is soft and not sticky. If you find your dough is too wet, add more flour. If it is too dry, add more water, starter, or whey. Once dough is complete, place dough ball back in the (lightly-greased) bowl, cover with a plate, and leave to sour till the evening. While the oven is preheating, if you haven't already, roll out your dough. Poke rolled-out dough several times with a fork. Then pop it in the oven for about 5 minutes while keeping an eye on it. Don't let it get too dark. This is just the pre-bake. brush with olive oil and add your favorite toppings! Bake your decorated sourdough pizza for 10 to 25 minutes depending on oven temperature, toppings and crust thickness. *I feed my starter the night before the morning I want to prepare the pizza dough. This ensures that I will have enough happy ready-to-go starter for the recipe and some left-over for future sourdough adventures. *I usually feed my sourdough starter a ratio close to 1:1 (flour/water). Depending on what I am making, I may use more flour for a thicker starter. For this recipe, it doesn't matter how you feed your starter. You will correct any consistency deficiencies while kneading. *This recipe will work for thick or thin crust. What's your preference? Roll out your dough accordingly. *I like to do my second bake directly on the oven rack (I might turn down the heat depending on amount of toppings). This creates a deliciously crispy crust. Because the crust is pre-baked, it slides easily off the cookie sheet and onto the oven rack. Once the pizza is finished, I slide it back onto the cookie sheet for easy cutting. What are your favorite nourishing sourdough pizza toppings? 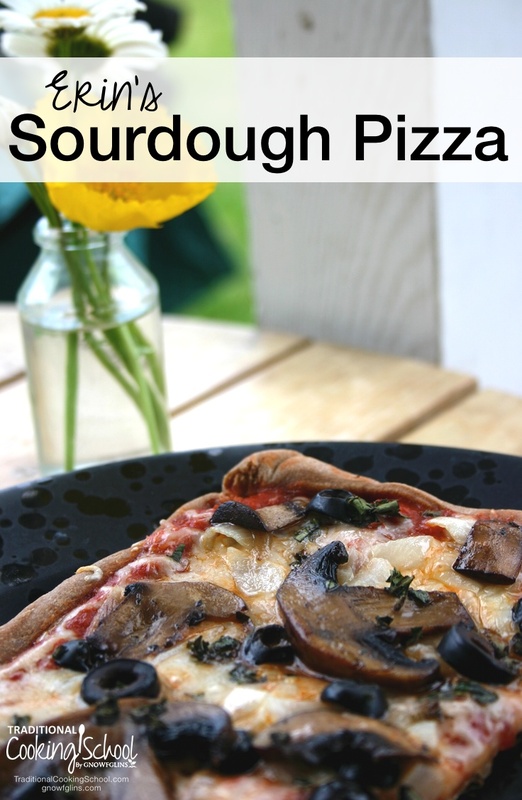 Have you ever made sourdough pizza? I love the fact you can freeze the pre-baked pizza crust for an instant week-night dinner! Would you let it defrost before putting toppings on and baking, or do you put it directly into the oven frozen? I’m not a celiac but I do try to stay as close to a gluten free eating regime as possible most of the time because I’ve found it takes my joint pain (from arthritis) completely away when I remove gluten…I have a pizza crust that I came up with that has the crunch of real pizza and you’re welcome to check it out and try it. It’s on my fb page https://www.facebook.com/photo.php?fbid=10201244783388763&set=pb.1446921839.-2207520000.1391054702.&type=3&theater. If you have a problem using that link just search for me Barb Childers. I used the instructions here to create a gf starter using brown rice flour and it was pretty darn good! Kylie- Thanks for your comment. 🙂 A couple thoughts for you… You could par-bake the crust, cool, freeze, top with goodies, and refreeze. For a quick meal, place the completed frozen pizza directly in your preheated oven and bake until crust is browned and cheese is melted. You could also have your frozen crust sitting out while you prepare your toppings and preheat the oven. The crust will be partially thawed by the time you are ready to bake it. I was wondering if I could freeze the dough before rolling it out and pre baking it? Most definitely! Enjoy your pizza! Karen- Your comment made my mouth water! Just the sound of Fatted Calf fennel sausage… Mercy! 🙂 I think the splash of olive oil, the pre-bake, and the thinner crust baked on the rack for the second baking all work together for a deliciously crisp crust. I’d love to hear what you put on this one! Thanks for the comment! Do you use the “Mike’s Way” starter? I’ve done the NT rye starter for loaf bread with mixed results. Perhaps I’m not patient enough… ? Kirsten- I used Mike Avery’s method (pretty much) for creating our own sourdough starter. Very satisfying, I must say! 🙂 Are you having a hard time creating a starter, maintaining a starter, or using your starter for baked goods like bread? Do you think you could just freeze the dough ball after it has ‘soured’ for 8 hours or so? Just wrap in plastic wrap and freeze for a later pizza? Tara – I did that last night with two dough balls. I’ve done it with other pizza dough, so I figured it would work for this. I am looking forward to easy-peasy pizza on the weekend! I decided to make two today after seeing how much starter I had. I think I’ll make one tonight, although I’m going to make more as a focaccia bread than a pizza. The other dough ball will be wrapped and put in the freezer for an already soaked and ready to go pizza or focaccia. .-= Tara´s last blog post… Soft Raw Goat Cheese =-. Erin, thank you for posting your sourdough pizza crust! You know I have been waiting for this! 🙂 I made a double batch over the weekend which made about 3 medium to small pizzas. Everyone enjoyed them and the leftovers were warmed and tasted even better. with us. I live in PA and will never probably get to Alaska. Karen- Thanks for your kind comment! So glad you and your family enjoyed the pizza. Your topping choices sound delicious. I made pizza tonight and thought I’d do a little report back. 🙂 Well, I forgot to prebake the crust, and I thought all hope for a crisp crust was lost. Not so! I baked it for awhile on a greased cookie sheet at about 400 degrees and moved it onto the oven rack for the final minutes of baking. Crispy and delicious! Erin – That sounds really good. I was wondering about no sauce, because there’s one person in my family who doesn’t like soggy bread – which sauce usually does to the crust, even with a crisp crust. I like the idea to brush with olive oil and will try that next! I was hoping to make calzones with this recipe later in the week. Any recommendations on baking this recipe into a calzone instead of pizza? Will pre-baking the dough make it too firm and crispy to then remold into the pockets needed for calzones? Thanks!! Charis — Check out this post on Pizza Pockets, where I used this sourdough crust recipe. The only thing is that if you over-sour the dough, it won’t roll out well but will break instead. So in warm weather, sour it for less than 8 hours. Sometimes 8 hours is too much. Made the pizza crust and the Basic Sourdough Bread today. The bread did not rise, very much a fail. BUT, the pizza crust was highly successful. I topped it with basil pesto, sausage, red onion, red & green tomatoes, and a little 3-cheese blend I had. All toppings local & organic–we know the farmers that raised everything I put on there–and we scarfed it down!! Looking forward to leftovers tomorrow! Erin,I have a pizza stone, but not the fancy paddle thing that you push it onto the stone with. I am just afraid it wouldn’t want to come off! So what I do is preheat my stone, and roll my dough out on parchment paper. Then I use a baking sheet turned upside down to push my pizza onto the stone with, parchment paper and all. Sometimes I remove the parchment paper after the crust has had time to crisp up some. Wardee, are you going to show us how you do your big batch cooking with sourdough? I would like to know how you do this, because once I am already in the kitchen dealing with flour, I might as well cook in quantity. Do you put the pizza on the lowest rack in the oven? I wasn’t sure which rack to put it on. I cooked my pizza at 450 degrees for five minutes, added the toppings, and cooked for 20 more minutes. It tasted yummy; however, the crust was not crispy all the way through. The dough seemed to be crisp on the edge, on top and on bottom, but seemed raw in the middle between the top and bottom of the crust (not the middle of the pizza). I used a 12 inch round aluminum pizza pan. Should I have used a larger pan so that it would be thinner, and then maybe the crust wouldn’t have been raw in the middle? Thanks for all the great recipes! I’m a beginner to all of this and am having a blast!!! I just noticed that this recipe is different than the one in the ecourse. Is there any reason for that? Wondering which one to go with… assuming the ecourse one is more recent. 🙂 Thanks!! As far as using a hot stone. We roll out and “decorate” our pizza dough on parchment paper, then together (you need a second set of hands) move the parchment to the stone and put it in. Also, because our oven doesn’t get very hot, we usually use our propane grill outside… with the two outside burners on and the middle two off so it doesn’t break the stone. Thanks for the recipe… can’t wait to try it! We loved this! It was my third sourdough creation and I was surprised that it rised quite a bit while it was soaking. I used spelt flour and plan to make this weekly. So how terrible do you think it will taste if I didn’t add salt…because as I am cleaning up I see I am putting away my sea salt that I never used! Aaaaahhhh! I do not have enough starter to do another batch, do you think it will make a BIG difference? Why does the crust have to be prebaked? Hi Toni- It’s not necessary. I do it to assure a crispy, non-doughy, non-soggy crust. I’ve done it without pre-baking, though, and it was still delicious. I think the trick to a crispy crust is to slide the pizza directly onto the oven rack a few minutes before taking it out. Enjoy! Thanks so much Erin for your quick answer. I just received 25 lbs of fresh sprouted whole spelt flour and I’ve got a wonderful active sourdough going that I can’t wait to try out. I do really like the idea of being able to par bake a crust and have it ready in my freezer for dinner on busy days. I’ve also started making a water kefir soda that is so wonderful! I’ve never had anything so tasty and good for me at the same time.I’ve had a life long struggle with candida that is finally healed to the point that I can eat many things I could only dream of before. I’m so excited to start baking again. Thank you all for your wonderful post on healthy eating. I’m learning so much about cultured foods. These foods are changing my life for the better and I can’t say enough good things about this blog! Thanks again. Quick question: does one start this recipe with cold starter, or active starter? Actually, the starter I had ready was active, I just wasn’t positive that this was what the recipe required. Several of the pizza crust recipes I had looked at called for cold starter. Anyway, I went with my instincts and prepared it with active starter…wonderful! This is my new favorite crust. Thanks so much, Erin! I loved this recipe! I usually don’t pre cook the crust though. It comes out great. I have done it and removed it to freeze though, and that reheated well. Much better then those store bought ones looked. I love having company over for lunch to do a make your own pizza. It’s so easy entertaining by just doing up a big batch the night before, and putting it in the fridge until needed. Hi Wardeh and Erin! I notice that the recipe calls for adding salt before setting the dough to sour. I typically don’t add spices/salt to souring dough because of the antiseptic/antibacterial qualities of salt and some spices. I was afraid the enzyme and bacterial activity would be inhibited. Am I wrong in thinking this way? Is it really not a concern? Thank you! I forgot to add that I made a double batch of this crust this morning. I made it gluten free with sorghum and arrowroot (my starter is predominantly buckwheat). This made a beautiful dough using your exact measurements of flour. It was slightly sticky, but GF dough typically is. It still had a lovely elasticity and was easy to work with. I pressed it out gently on my seasoned pizza stones to sour. We haven’t eaten it yet, but I’m quite sure we’ll love it. Easy to work with is nearly as big a deal in my book as the taste! Thanks for another great, nourishing, easy recipe. I have been looking forward to making sourdough pizza for a long while but have been reluctant to start ONE more thing when I was already struggling keeping up with all the other things I have going on. From they busyness of four teenagers at home to carpooling school plus sports seasons, to kombucha and vegetable ferments, to chickens and farm runs, to my own stumbling health (adrenal/thyroid and all that can entail) I am having to accept limitations that are uncomfortable. I did finally open my Camaldoli Italian heirloom sourdough starter and get it started, just a few days ago, and in looking for ideas of what to do with my throwaway portion twice a day I thought I might start with pancakes… until I saw your post. Ah yes, sourdough pizza crust, my long lost love. So, I mixed up your recipe and had every intention of making one smallish pizza tonight as a sampler for the family (7 of us here, one pizza is an appetizer!) but then… Kate, over at Modern Alternative Mama, posted today with a recipe for soaked tortillas and I had an epiphany! Hi Bebe- So glad you are making the sourdough pizza crust work for you! There are several delicious sourdough recipes on Wardeh’s site, but I encourage you to also check out the Sourdough E-book. Tasty sourdough recipes galore… including one for sourdough tortillas! Thanks for your comment and for sharing your enthusiasm! Made me smile! And Wardeh… thanks for inviting Erin to do a guest post! How would I modify the recipe for Sourdough Pizza Crust using freshly milled Red Whole Wheat Flour? DeAnna — You would use additional flour, during the part of the recipe where it tells you to add more until you get the right dough consistency. 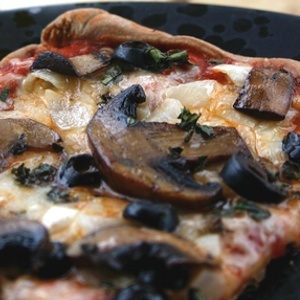 I love this pizza crust….I have made several other GF/CF crusts and they were hardly edible…I am excited I finally have one that I enjoy and it so easy…..Thank you for sharing this recipe. I roll my dough out on oiled parchment paper and that slides on and off of the pizza stone easily, especially using a pizza peel (giant spatula), though the oven temp. must not be over 450 to use parchment paper. I’ve not used sourdough before though, look forward to working with it. Try using parchment paper to roll your pizza dough out onto and bake on the pizza stone with the parchment paper underneath the crust. Be sure to trim the edges of the paper close to the edge of the dough as it tends to burn otherwise. I use parchment under my gf sourdough crust because it’s far too delicate to move around after rolling out. I use a 500 degree oven with the stone preheated and while I pre-bake the gf crust, I don’t the regular crust. looks very yummy! Can not wait to try it! This is a great recipe, and I love the par-baking option. I doubled the recipe and made 4, 9×13-sized pizzas, each diugh ball weighing 12 ounces. Next time, I’m going to par-bake and freeze for later use. This is such a great way to use up lots if starter! I wish I could see the actual crust in the photo. I have been making standard (non sourdough) pizza crust for years now, and my trick to getting the crust off of the peel and onto the preheated stone is to sprinkle the peel with organic corn meal before putting the rolled out crust on it. The corn meal acts like tiny ball bearings to roll the pizza off the peel. The peel does have to be dry for this to work. When children spill sauce over the edge of their pizza, it tends to catch and not slide so easily. I think I will try this recipe tomorrow for our regular pizza night. Thank you so much! Could I freeze the dough before its rolled out and pre baked? We had this last night and it was lovely! I had a tiny bit of dough leftover (I rolled my crust super thin and had to cut it to fit it on my pan). I rolled the extra dough super thin, brushed with olive oil and sprinkled with salt and dried thyme. They turned out to be some of the best crackers! My sourdough was super sour and it made them taste cheesy! (Like I remember “Cheez Itz” tasting! I haven’t had a Cheez it in forever!) Thanks for this recipe!